Heat oil in kadai , add garlic paste , green chill ,sauté . add palak paste ,salt , red chilli powder ,garam masala , mix well . Add curd, cream and cook for 2 to 3 minutes .switch off the flame ,add lemon juice , mix well . Heat grill pan ,put paneer pieces . apply some butter , sprinkle salt , red chilli powder and grill for 1 / 2 minute or paneer gets grill mark . Take serving plate , pour palak gravy , arrange grilled paneer over gravy , serve hot with paratha or nan . Tip : Do not grill paneer more than ½ minute otherwise paneer gets hard. 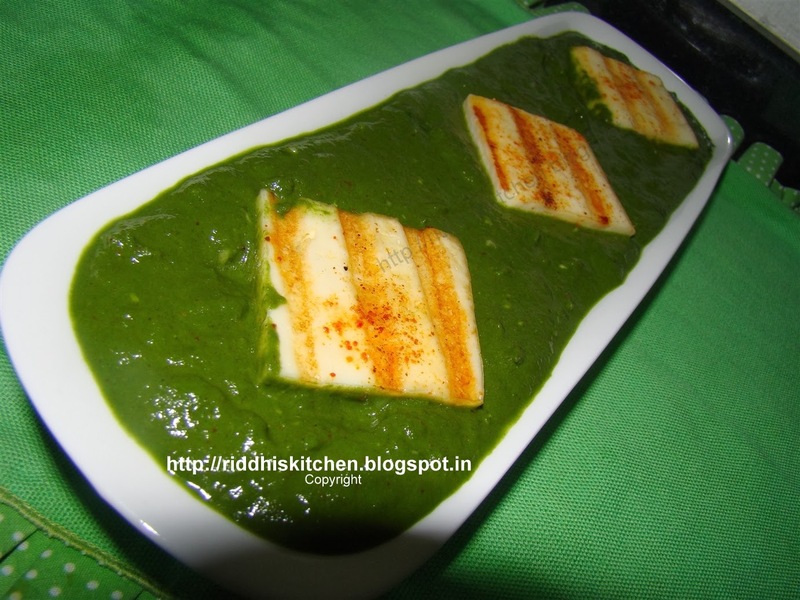 I make palak paneer without onion and tomato, you can add onions paste and tomato paste .